Like legs, shoulders can be difficult to work on as well and there are no doubts about the fact that exercise and diet can help you get exactly the kind of shoulders you have been working to get. After all, a good pair of delts is just not for boys, right? To get things started, it is important to know that the shoulder is actually made of three different muscle sets and hence, the exercises will be such that they target each group either simultaneously or separately in order to give you the perfect shoulder. We have listed 7 best shoulder exercises for women. Following these shoulder workout tips diligently is as important as the pre-workout warm-up sessions. Arm circles, neck rotation, wrist rotation can be a start. 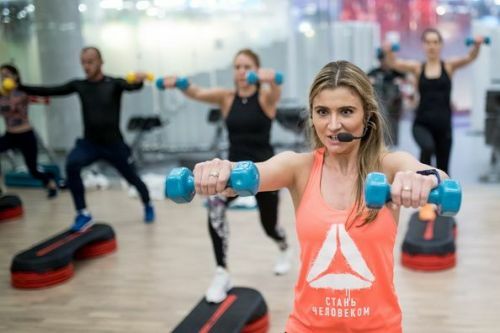 Warm up and cool down sessions can be very crucial because when you are working with dumbbells you are exerting a lot of pressure on your muscles. This way, you end up activating them and they need to be calmed down and re-energized before you move on. Note: for the weight that you choose, please be rational. Overdoing the weights can actually lead to dead muscles, resulting in stagnation. So be careful with the weights. Step 1: Sit straight on a flat bench, while keeping your feet on the ground. The posture is extremely crucial, so slouching and lifting your feet up is a serious no-no. Step 2: Hold the dumbbell at your ear-level, keeping your palms forward. The dumbbells have to be placed lengthwise. Step 3: Push your arm up until they are nearly straight, not bending your wrist in the process. Do not lock your elbow while you reach the top. Step 4: Slowly bring your hands down to get the dumbbell to the ear level and repeat. Do 3 sets of 15 each and increase the weights when your body gets used to the old set. Also, read 6 Ultimate Shoulder Exercises For Boulder Shoulders.